While we humans value the mighty oak tree for the strength and resiliency of its wood, its natural beauty and the amount of shade provided by its large canopy, certain animals use this tree for more practical purposes. Several species in the animal kingdom depend on oaks for food sources as well as protection and often can be found in their treetops or burrowed in their wood. 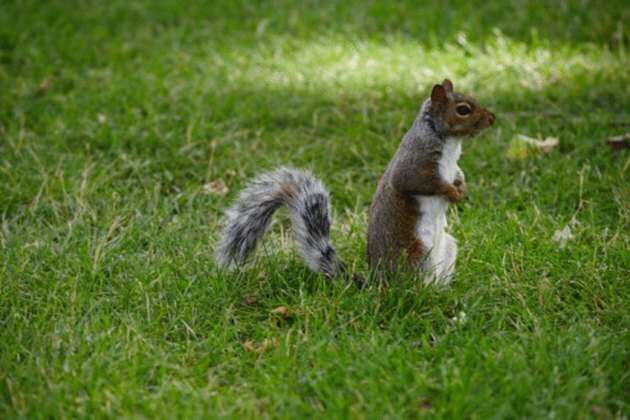 One of the more common animals often seen scurrying in and around a grove of oak trees is the Eastern Gray squirrel. These little critters nest in holes in older oak trees and oak tree acorns are a staple of their diets. Similarly, raccoons can often be found nesting in larger holes or tree forks, and they often scavenge the ground around an oak's trunk for nuts, leaves and insects. The most commonly seen possum species seen in oak trees is the Virginia Opossum, also known as the North American Opossum, a marsupial that nests in its branches. Larger mammals, such as foxes, often make dens in downed, hollow oak trunks. Many species of birds call the canopies of oak trees home. 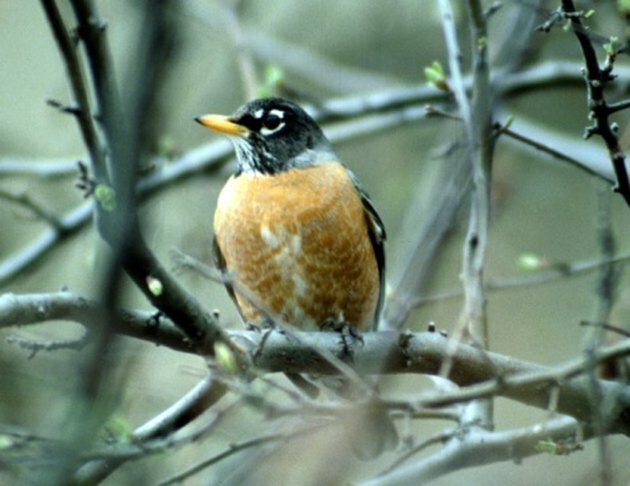 The actual species that nest in the trees depends largely on geographical location, but generally speaking robins, blue jays and starlings are among many of the types of birds that nest high in the canopies of oaks to distance themselves from potential predators. Some woodpeckers not only peck for insects in the oak tree's bark, but also nest in these trees as well. 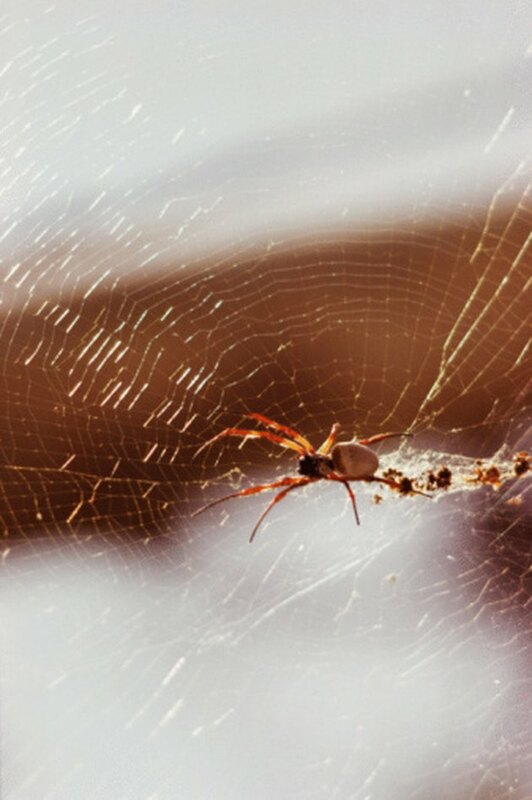 Spiders snack on oak-dwelling insects. As you might expect, the species of insects that burrow in and around an oak tree's bark are numerous. 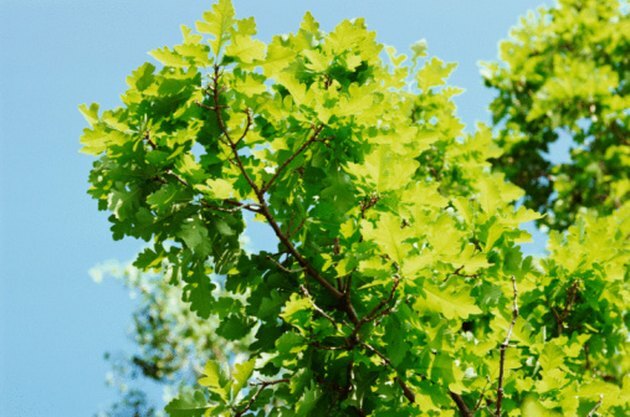 Ants prefer to tunnel underneath the oak tree's root system while tent caterpillars, spider mites, gypsy moths and oak-tree-specific oak leafrollers and leaftiers caterpillars feast on the oak's leaves while using those same leaves as camouflage from predators. These insects invite the presence of spiders, who in turn feast on them. Depending on the height of the trees, spiders such as Argiope, or writer spider, spin their webs across oak branches to catch passing insects. Copperheads make their homes in fallen oak tree trunks. If an oak is near a water source like a swamp, river, lake or pond, smaller reptiles such as salamanders or frogs may use exposed root systems to hide their nests along the waterline. Snakes that prey on these reptiles as well as snakes that take advantage of the cover provided by the roots may nest here as well. 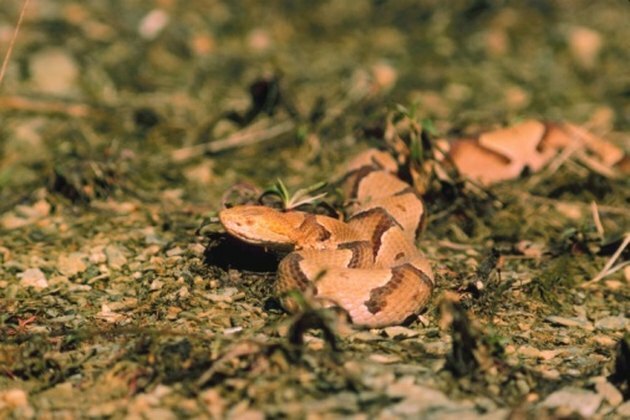 Close inland, downed oak logs are home to other snakes such as copperheads, black snakes and garden snakes, to name a few. What Kinds of Trees Will Woodpeckers Peck?